POMONA >> Atalia Cervantes walked out of the state Department of Motor Vehicles field office here Friday with a precious slip of paper in her purse. Not only did she pass the written portion of the DMV’s driver’s license application process, she was able to get her old license renewed. Cervantes is one of about 11,000 undocumented immigrants statewide who by 3 p.m. Friday had gone to DMV offices and applied for driver’s licenses under the provisions of Assembly Bill 60, DMV spokeswoman Jessica Gonzalez said in an email. Like a proud father, Los Angeles Councilman Gil Cedillo on Friday greeted people in the lines that wrapped around the new DMV offices in Granada Hills. Cedillo walked hand-in-hand with the first applicants when the doors to the office opened. Cedillo, who critics branded as “One-bill Gil” for his constant pressure to get AB 60 enacted, has been working on the measure since his first election to the state Assembly in 1998. In Long Beach, a protest was held outside the district headquarters of powerful state Sen. Ricardo Lara, D-Long Beach, who hailed the law as a move to enhance fairness and traffic safety. The roughly two dozen protesters outside his office denounced California’s policy as a criminal violation of federal immigration law. Among those who spoke at a rally organized by a Claremont-based anti-illegal immigration group We the People Rising was Dan Rosenberg of Woodland Hills. Rosenberg said his son Drew was killed in a 2010 collision involving an undocumented driver and that he has decided based on his own research of traffic safety data that giving licenses to undocumented immigrants will not improve traffic safety. Applicants report a range of experiences. “It’s kind of a mixed bag. There’s people that have had complaints about their treatment, like rudeness and that sort of thing, and some people who have had wonderful experiences, that were treated like kings and queens,” said Wood, who leads license study sessions. Wait times depend on the location, and whether people make appointments or stand in line. In Pomona it’s difficult to secure an appointment, causing people to drive to neighboring DMV offices. “I know someone who drove all the way to Hemet to take their driving test because they could get one earlier” than in Pomona, Wood said. Navigating the labyrinth of DMV lines, appointments, applications, paperwork, fees and, finally, written and road tests hasn’t been the most challenging part of the process. Complications tend to arise with nonstandard cases — people who had driver’s licenses before and others who speak indigenous Latin American languages. The majority of people in California without documentation are Latino, many of whom speak Spanish or native languages. AB 60 — The Safe and Responsible Drivers Act — signed October 2013, allows people to apply this year for a driver’s license using a federal individual taxpayer identification number and other documents, instead of a Social Security number, which most undocumented immigrants do not have. They also must show proof of California residency through electric bills or similar documents. Over the next three years, experts project roughly 1.5 million people will apply for the specially marked cards that specify the identification is for driving purposes only. Some undocumented immigrants have been driving since they were legally allowed to drive in California, before 1994 when Republican Gov. Pete Wilson signed a law requiring immigrants to provide the DMV with a Social Security number to apply for a license. DMV officials are sifting through old driving records and new applicants, and there’s still some confusion. “They told us if you had a California driver’s license in the past, you wouldn’t have to take the behind-the-wheel. That was true for some people who have had a past California driver’s license, but it wasn’t for others,” Wood said. 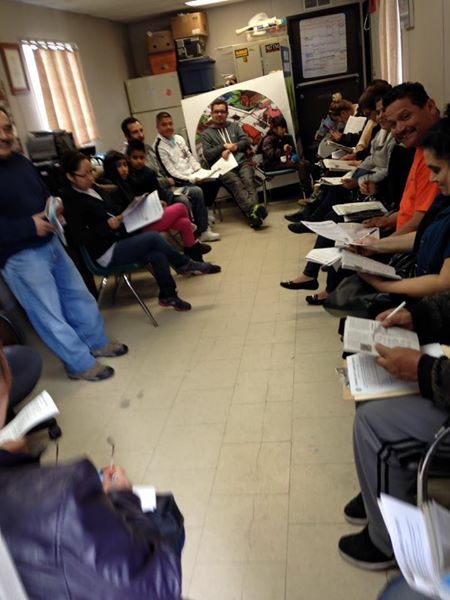 Last week, advocates for indigenous language speakers in Mexico were chasing down answers from the DMV because Mixteco speakers were being told they could not use translators to take the written driving exam. “They said for now, they don’t know how to do it,” said Juvenal Solano in Spanish, organizer of the advocacy group Mixteco Indigenous Community Organizing Project based in Ventura County, where there is a large indigenous population. DMV officials had told his group Mixteco speakers needed to compose 5 percent of all DMV applicants to have a test provided in Mixteco. But the next day the department changed its answer, saying a translator could translate exam questions while a DMV employee documents the answer. They cannot assist during the driving exam. Solano plans to teach basic Spanish to Mixteco speakers, many of whom already have a working knowledge of the language, to pass the behind-the-wheel test. Ultimately, he wants the audio exam translated to Mixteco because of the low literacy rate in that culture. “We’re only asking for equality, justice … like other communities, Japanese, Punjabi … they have the audio test,” Solano said. In Culver City, standing in a long line outside the DMV on Washington Boulevard, test-taker Carlos Martinez wasn’t so concerned with the test. He planned to pass on confidence and driving experience. Beside him in line, Armando Jimenez spent all of January studying the DMV booklet and taking online practice tests. Both secured appointments in several weeks. Jimenez smiled at his neighbor’s confidence and said he had been driving for eight years but still needed to study. Some people who have been driving for years sign up for the test whether they’re prepared or not. Others are flocking to study workshops at the Pomona Economic Opportunity Center. Organizers are asking people such as Yensy Aguilar — who passed the test — to set up informal classes at their churches, schools and community centers, to handle the onslaught. Aguilar said the workshops explain when certain words or ideas don’t translate on the Spanish test. For example, the Spanish word colchon — or cushion — is used metaphorically on the exam to mean a safe space from the car next to you, leading Spanish speakers to think of air bags, Aguilar said. Some applicants are intimidated by the touch screen testing stations. Pass and fail rates will be released in February, along with a more in-depth report analyzing regions in the state, Gonzalez said. So far, rates were calculated only the first day, Jan. 2, showing 54 percent of English test-takers passed and 36 percent of Spanish test-takers, an improvement over rates before AB 60, which were 50 percent for English and 27 percent for Spanish. For Aguilar, who missed three questions, the high score is not important, it’s the freedom that comes along with it. Immigrants feared driving without a license, having seen their cars impounded and being screened for deportation by federal immigration authorities. Freedom to drive equates to freedom in life, Aguilar said.